Time for another CPS Challenge #132. I must admit I've been a bit slow with this layout (not sure why). 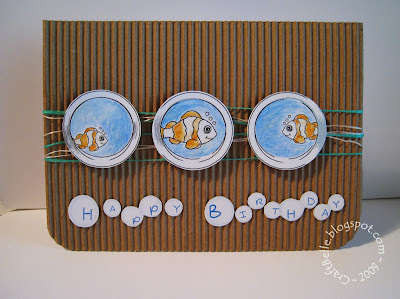 So, I headed over to the sponsor's site Sweet N Sassy Stamps to see what they are all about and I found this little Clown Fish. Each Thursday Sweet N Sassy give away a digital stamp (cool huh!) and the Clown Fish was this weeks freebie. So cute! Firstly, I rotated the sketch (I'm a landscape kinda girl). 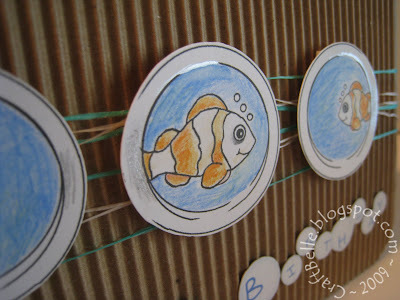 I resized the Clown Fish and made some portholes for them to swim behind (all in MS Word would you believe). Then I coloured them up with watercolour pencils and silver pen for highlights. My hubby suggested some bubbly text for the sentiment (thanks sweetie). A few snips and some double sided sticky and it was all done. Digi stamps are pretty cool - Thanks Sweet N Sassy. Very cute! I like how you did the letters below the fish!